Worried about how to take care of your Bermuda grass in the fall months? Kemko has your back. Fall lawn care is often neglected because people think the growing season is coming to an end. And with the kids back in school, with the weather being much easier to tolerate than the summer heat and humidity, our busy schedules tend to draw us away from our normal lawn care regimen. Now that Fall is Here, What Does Your Lawn Need? Bermuda grass benefits from a potash application in the fall. This important nutrient encourages a healthy root system through the cold winter. Healthy roots will also facilitate vigorous growth in the springtime. You need broadleaf weed control. Broadleaf weed control is equally important to maintaining healthy Bermuda grass in the fall. Knocking out weeds in the autumn allows the grass to get all the sunshine, nutrients, and water it needs for sustained growth and vitality. You might need pre-emergent treatment now, too. Pre-emergent treatment is important for preventing poa annua infestation during the cool season. Poa annua is extremely common in Atlanta; it’s the clumps of grass you see everywhere that grow tall tassels. Applying pre-emergent now will prevent poa annua from robbing your turf of the resources it needs to stay healthy. What do you need to know about cool weather grasses in Atlanta? Once we get into the colder weather, mowing and trimming will slow down. Cool weather grasses don’t grow quite as vigorous as summertime lawns, but it’s still important to avoid cutting more than 1/3 of the blade height at once. Trimming more than that at once will restrict the grass plant’s ability to absorb nutrients and utilize sunshine. Don’t Neglect Your Lawn When the Temperatures Drop. The importance of careful weed control measures in the fall can’t be overstated. With Atlanta’s comfortable winter temperatures, weeds and weed seeds don’t go dormant. Unlike our neighbors to the north, we simply don’t have that luxury. Georgia’s homeowners have to stay vigilant year-round in order to keep their weed situations under control. On the other hand, there’s no need to neglect your duties to family and work so that you can work on your lawn. 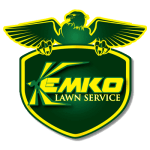 Kemko Lawn and Shrub can take care of your lawn while you’re tending to your life! In fact, we are willing to bet that with Kemko on your team, you will notice a major improvement in the appearance of your lawn this winter. Click to request a free estimate for weed control for your Bermuda grass in the fall.